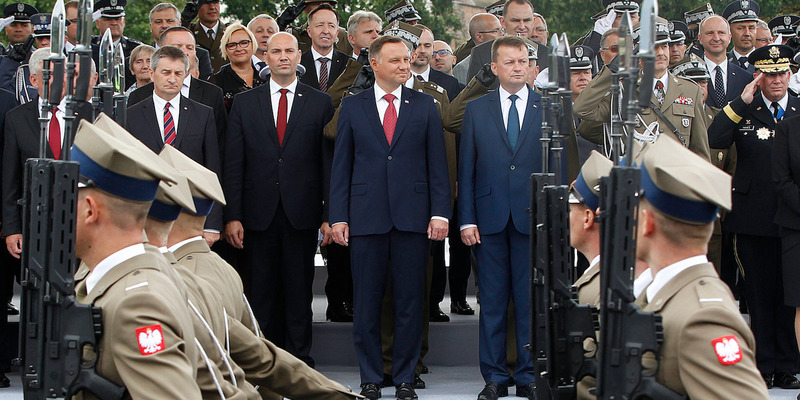 (AP Photo/Czarek Sokolowski)Polish President Andrzej Duda at the Polish National Army Day parade in Warsaw, August 15, 2018. Poland wants the US Army to set up permanent military bases on its soil. It’s not the first time Poland has made that request, even though the US and other NATO members already have rotational forces in the country. Poland and other NATO members in Eastern Europe are wary of Russia, who they see as increasingly aggressive. 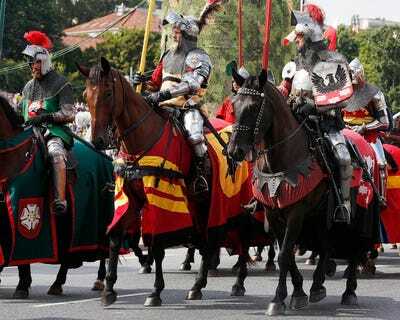 As military personnel paraded through Warsaw on foot, horseback, and armoured vehicles on Wednesday, Polish President Andrzej Duda reiterated his country’s call for a permanent US military presence on its soil – a presence that the Eastern European country has said it’s willing to pay $US2 billion to get. A permanent US Army presence would “deter every potential aggressor,” Duda said, it what was almost certainly a reference to Russia, whose recent assertive moves in Europe – particularly the 2014 annexation of Crimea and incursion in Ukraine – have prompted NATO members to increase their activity along the alliance’s eastern flank. (AP Photo/Alik Keplicz)Polish soldiers march on one of the city’s main streets during a yearly military parade celebrating the Polish Army Day in Warsaw, with the Royal Castle in the background, August 15, 2018. This year’s celebration was larger and more vibrant than usual because it marks the centenary of the country regaining its independence after a 123-year period during which it was divided among Russia, Prussia, and the Austro-Hungarian Empire. His comments also came a few months after Poland’s defence minister, Mariusz Blaszczak, said he had discussed establishing that permanent presence with US officials. (AP Photo/Alik Keplicz)Polish soldiers greet people as tanks roll on one of the city’s main streets during a yearly military parade celebrating the Polish Army Day in Warsaw, August 15, 2018. Blaszczak said the US Senate had contacted the Defence Department about the matter. Local media reported at the time that Poland was willing to spend up to $US2 billion to finance a permanent deployment. The US has yet to respond to the request. Such a deployment would be costly and would almost certainly anger Moscow, which has sharply criticised NATO’s recent deployments and military exercises in Eastern Europe. 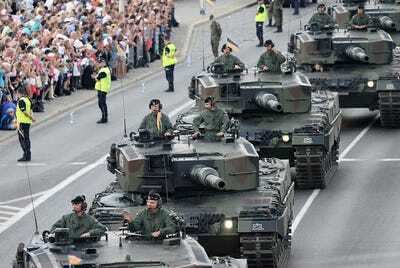 Poland has lobbied NATO for a permanent military deployment in the past. In 2015, a US diplomat said the alliance would not set up permanent military facilities in the country. At the time, the diplomat said the US would maintain a “permanent rotating presence” of US military personnel in the country. Since 2016, NATO has deployed multinational battlegroups of roughly 4,500 troops each to Poland, Lithuania, Latvia, and Estonia. The battlegroup stationed in Poland is led by the US and includes personnel from the UK, Romania, and Croatia. 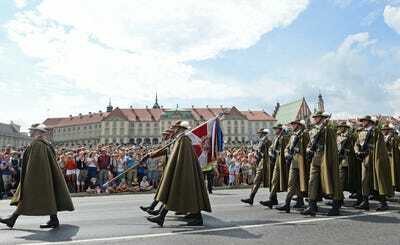 (AP Photo/Czarek Sokolowski)People in historical military costumes during an Armed Forces Day parade in Warsaw, August 15, 2018. US forces and troops from other NATO members have carried out a variety of exercises in Eastern Europe in recent months, as the alliance works to deter Russian aggression. Those exercises have focused on established capabilities that had fallen out of use after the Cold War – like manoeuvring and interoperability between units – as well as new practices to fend off Russian tactics, like cyberattacks and hacking. President Donald Trump has also goaded NATO members to increase their defence expenditures more rapidly, believing they unfairly allow the US to shoulder the bulk of that expense. Members of the alliance have boosted their spending (though some have done so with the aim of reducing dependence on US arms makers). Poland has already met the 2%-of-GDP defence-spending level that the NATO allies agreed to work toward by 2024. On Wednesday, Duda said he wanted Poland to increase that outlay even more, reaching 2.5% of GDP by 2024.